Nitin Nagrale, Founder and General Secretary of the Forum gave a presentation on HPMF achievements. Tracking the journey of the Forum that is now over 2000 members strong, it has recently opened chapters in Sri Lanka and Dubai and is now looking to include countries like Spain, Chile, Canada and USA. Guest of Honour Giriraj Singh Lotwara humourously complimented Nitin on his purchasing skills saying, “You have purchased our hearts without paying a single penny!” Rahul Pandit, also a Guest of Honour spoke about the need for creating best practices for Hospitality Procurement and lauded HPMF for creating such a wonderful platform for sharing such practices. In sync with the keynote speaker, he advocated vendor development by promoting the practice of ‘Make, Buy and create quality in India’. 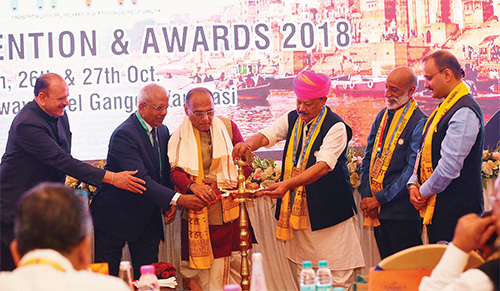 Referring to Varanasi, the oldest living civilization as ‘The City of Learning and Burning’, Dr. Rajnikant addressed the audience with the view that the skill development in Incredible India should extend to encouraging artisans to keep alive traditional arts and crafts. The panel discussion on the upcoming trend of Block Chain in Hospitality Supply Chain Management was moderated by Harish Chandra, Director of IT at Sarovar Hotels, Gurgaon. It was a thought-provoking interaction on this option highlighting how it will assist in eliminating corruption because of its transparency and the complete traceability by being recorded in the system. It also enables removing the middle man when making reservations. We can only wait, watch and hope that the Block Chain Technology will eventually make a foray into the Hospitality Sector. A very passionate presentation by Yogita Salunkhe, Manager at Envirocare Labs Pvt. 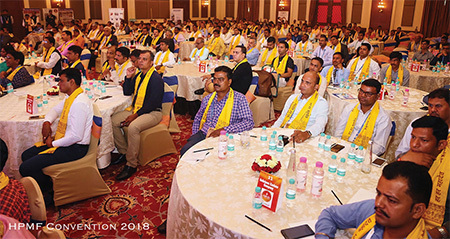 Ltd on ‘The impact of FSSAI on purchasing’ was extremely informative not just for Purchase Managers but also for anyone connected with food in any way including the common man. Serving safe food to customers is a shared responsibility. FSSAI is a single authority that controls food safety and standards. While benchmarking quality and safety standards for global acceptance is the objective of this authority, there is also a need for monitoring surveillance and self-compliance. Labelling is mandatory stating nutritional information, allergens present and organic compliance. Food service establishments require to place Food Safety display boards. Going beyond its intended purpose, FSSAI has two recent campaigns – the Eat Right Movement with colour coding for Salt, Sugar and Fat and the Effective Usage seeking zero wastage via Think, Eat and Save. The main effect on Purchase is the cost of poor quality not only in terms of money but also reputation. The presentation by Silver Partner Welbilt not only covered the existing equipment for storing, cooking, holding and displaying as well as dispensing and serving equipment but also included the latest addition of coffee machines as well as the New Age innovation of convotherm equipment. Representing the dinner partner — Veeba, Gagan listed the range of sauces, dressings and fruit and chocolate toppings, some of which are fat free thereby appealing to the health-conscious consumer. The display area on the lawns had artisans demonstrating their crafts. In the adjacent seating area, the programme for the evening commenced with a brief presentation by a representative of Lavazza – the coffee partner for the event. The highlight of the evening was the presentation of the awards. Preceding the awards was the inaugural release of the HPMF video paying tribute to the Indian Defence Forces which received an unprecedented response of “Once More”. The screening was followed by the awards function where HPMF honoured eight Armed Forces personnel with the Manik Shree Awards. Needless to say, it was an emotional moment for the recipients as well as the audience. The HPMF also presented awards to its members honouring Mohan Deshpande and V.T. Alexander with the Kohinoor Award (Lifetime Achievement Award). In addition, Mani Ratna Award (Living Legends) was awarded to Kaushik Jhingan, Man Singh Rathore and Subramanyam Natarajan. There were many more awards appropriately titled to suit the recognition.